US thematic maps are a section of maps designed with a purpose of providing specific information. These visually enhanced thematic maps are aimed towards better understanding and leaning of users. 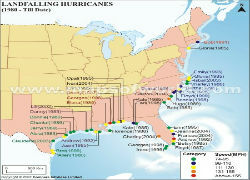 USA time zone, USA population, USA temperature, USA land falling Hurricanes are some of the interesting maps of US thematic maps section. USA time zone map depicts division of USA according to various time zones like Eastern Standard Time and Mountain Standard Time. USA Wheat Growing Area map represents the wheat growing areas and its location in USA. The section also includes maps depicting temperature and landfalling hurricanes data bases on the month on January and July. These maps particularly can be of high usage for people interested in meteorology. Optimum for both educational and professional purposes, these USA thematic maps will provide consolidated information on various interesting themes. Being one of the most advanced countries in the World, the US has a vast and well developed transportation system. Air and road network are very popular. However, rail and ferry services also form a major part of the transport network. The road maps, railway maps and flight maps of USA help you to have a proper understanding of the transport network in the country. This will make your journey easy, quick and hassle free. 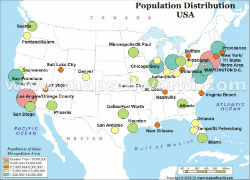 Mapsofworld.com provides you with various categories of US maps on physical features, political divisions, states, capitals and major cities, transport and lots more in the country. You can also get useful details on the location and boundaries of the country, the attractions, the business districts and lots more. Some of the well known maps available at Mapsofworld.com are USA physical map, USA Area Code Maps, USA State and Capital Map, USA Political Map, USA County Maps, USA road map, USA weather and precipitation map, New York Map, Texas Map, Hotels in USA, USA Road Map and so on.